It's not uncommon to find round, deep red garnet crystals embedded like pomegranate seeds in metamorphic rocks. It's easy to see why garnets took their name from the Latin word for "seed-like." When we think garnet, most of us think of those dark scarlet stones. But they can be any color, even blue. They normally require high temperatures and pressures to form no matter their hue, but one extraordinary variety defies that requirement. Garnet, it turns out, is a far more versatile gem than we'd suspected. And today, we're going to get acquainted with a variety that can make even seasoned geologists sputter "How is that possible?" It's not terribly surprising to find garnets in igneous rocks. But we'd typically expect to find them forming deep down, where temperatures and pressures are nice and high, then hitching a ride up with ascending magma. Finding them as xenocrysts may be unusual, but not impossible. And indeed, we've found rare occurrences of garnets in all sorts of volcanic rocks. We've discovered them in intrusive rocks like granites and gabbros. We've found them in nearly every type of lava a volcano can erupt: basalt, andesite, dacite, rhyolite, and even trachyte-phonolite. Some of them are the high temperature and pressure varieties like almandine-pyrope, which hitched a ride with ascending magmas. But there are some that couldn't have formed far below. At first glance, they seem impossible: large, well-formed crystals happily occupying cavaties in rhyolitic lavas and tuffs. The groundmass they're in speaks of fairly rapid cooling and low pressure conditions. So at first glance, you'd think they must be xenocrysts, little strangers with a far different history than the rhyolite. Look closer, though, and it's clear they must have grown within those cavaties, called lithophysae. They're surrounded by glittery carpets of pale gray quartz, sometimes even containing a bit of that quartz inside themselves as inclusions. They aren't embedded in the walls, but growing from them. How the heck did we get garnets growing in such a low-pressure environment?! Turns out it's down to how much manganese is around. Garnets aren't usually stable at lower pressures, which is why you generally don't catch them forming on the surface. Varieties like pyrope and grossular garnet, which have magnesium or calcium as part of their chemical makeup, can't really get started in low pressure environments. But another variety, spessartine, has manganese in its formula. And manganese makes all the difference. With it, garnet can grow under just a few kilobars of pressure. Start with a volcano erupting rhyolite, either as a flow or a very hot ash that formed dense deposits. These materials would have started at around 700-900 °C, and contained a lot of gasses. Those gasses, plus heated groundwater, would be looking for a way out. They would seek out joints and fractures, and find their way into the lithophysae. Water, hydrogen, and carbon monoxide would continue on their journey, while some metals like iron and aluminum, plus other condensable elements, would begin condensing into crystals. 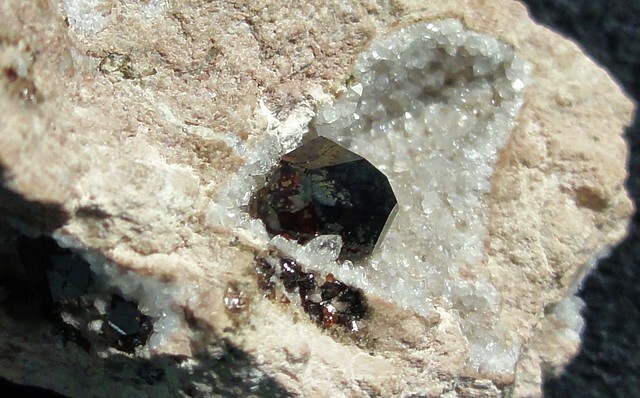 The temperatures were still relatively high: we know they must have been around 600°C, because the garnets formed alongside a high-temperature version of quartz called tridymite. Cozy within the flows, where cooling was slower, crystals grew, some up to half an inch or more. Tridymite made a glittery, druzy carpet around the deep red garnets, which got an extra boost of dark color from the bit of iron they incorporated. 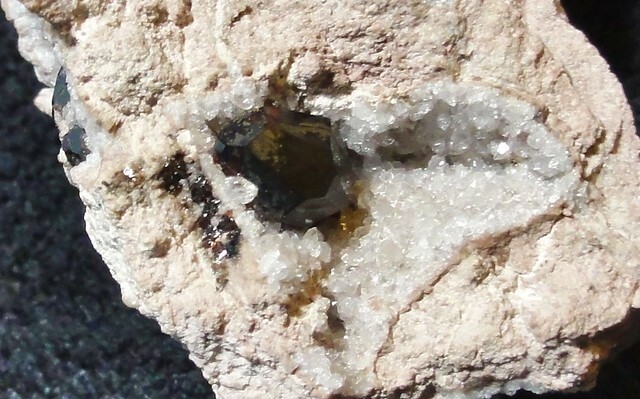 As they cooled, they sometimes fractured, and tridymite ended up growing in their cracks. In the end, once the flow had cooled, you had some magnificent almandine-spessartine garnets nestled with glittery tridymite (which was at times replaced with low-temperature quartz). And this is how we find them today, tucked within voids inside volcanic rocks we never would have expected to contain such a thing. Garnet is a truly remarkable gemstone. And this is just one of its many intriguing stories.